> No map can give humanity a special place in the universe. Abraham’s Arte at Vini e Capricci, is pleased to present ‘Leave at Dawn - Return by Dusk’, an exhibition which marks the third solo exhibition by Gozo/Malta - based artist, Mario Abela. At the root of Abela’s practice is his interest in existentialism – how we utilise fragments of memory, through images, sounds and history, to understand our own existence. In the past Abela has addressed and investigated this issue through large format drawings and collages, installations, videos, audio/visual performances. For this particular exhibition he is adding one more medium: paintings. Through chance and juxtaposition of these disparate channels, what starts as storytelling evolves into an exploration into fantastic, sublime worlds. This puts concepts like time, memory and chance under analysis, in order to establish how these, determine the interpretation of the past and sometimes forecast the future. In Leave at Dawn - Return by Dusk, Abela is questioning memory throughout life, casting doubt on human memory limitations and vulnerability. Most of the works in the exhibition are from memory, leaving the artist exposed to all errors and different probabilities to where a particular painting or drawing can head. The works look back at what in theory is called ‘constructed memory’. Unconsciously, humans tend to rely on such memories. These might never have actually happened, but they fit exactly in between gaps from one major event to another in life, distorting and filling these gaps with errors. The death of the artist’s father back in August 2018 was instrumental to bringing Abela closer to questioning existence. Specifically, this death becomes a memento mori: an event leading to the contemplation of the vanity of life and the transient nature of earthly pursuits. With a limited palette, Abela has built a romantic body of work, mostly paintings, inspired by his father’s daily errands on a Vespa across the Gozitan landscape. In sum, this presentation treats the artist’s relentless pursuit to unify the self with the universe. 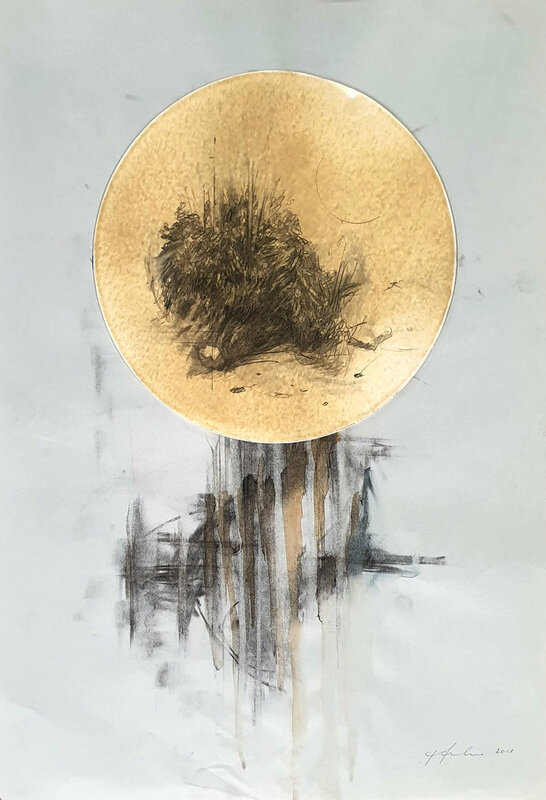 Although the medium is not what we are accustomed to in Abela’s past works, it is consistent with the line of work that he has been pursuing in recent years. Shifting in scale, large canvases are interspersed with smaller paintings, Polaroid photographs, and an installation creating a visual rhythm within the space. This is much akin to how Abela creates communication with visuals and sounds by using chance during execution. The exhibition will be open from 1st March till 2nd April 2019 at Vini e Capricci by Abraham's, Gozitano, Xewkija Gozo.